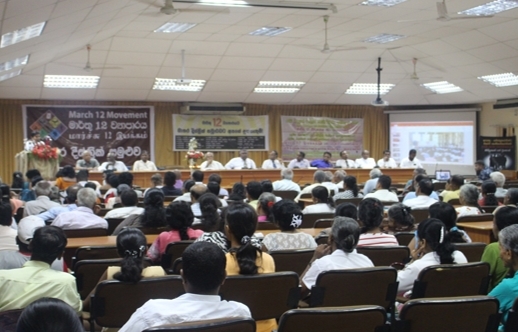 The March 12th (M12) Movement- a group of civil society organizations which advocates for a clean, corruption-free political culture in Sri Lanka- held a public awareness meeting in Matara on the 3rd of April, as part of a country-wide citizen’s march. The M12 Movement, which is chaired by the People’s Action for Free and Fair Elections (PAFFREL), raises public awareness on the need to elect clean political representatives who uphold the values of good governance, transparency and accountability. Transparency International Sri Lanka is an active member of the steering committee and organized the Matara District Meeting in coordination with its Matara Office. As part of the movement’s second anniversary celebrations, a country-wide citizen’s march was launched on the 13th of March 2017, across all 25 districts. The purpose was to educate people at the grassroots level on the need to elect clean political candidates for the upcoming local government election. It also aimed to exert pressure on political leaders to handover nominations to clean candidates. The Matara leg of the campaign commenced with a vehicle procession in the city centre and was followed by a gathering of government officials, activists, lawyers, media representatives, trade unionists, youth representatives, political party representative, civil society leaders, religious leaders and the public, at the Matara District Secretariat. A panel of key personnel presided over the meeting, consisting of the Executive Director of PAFFREL, Mr. Rohana Hettiarachchi; Matara District Committee Chairman, Mr. Mahinda Samarasinghe; Matara District Member of Parliament, Mr. Dullas Alahapperuma; Vice-Chacellor of the University of Ruhuna, Prof. Gamini Senanayake; Matara Provincial Secreatary, Mr. Ranjith Yapa; President of the Matara Law Association, Attorney-at-Law Mr. Ariyawansa Pannagala; Matara District Secretary, Mr. Pradeep Rathnayaka; Senior Attorney-at-Law of the Matara Lawyers Association, Mr. Chandima Muthukumarana; UNP representative, Mr. Upul Nishantha; and the Matara Municipal Commissioner, Mr. Senaka Palliyaguruge. Mr. Mahinda Samarasinghe delivered the welcome speech, and Prof. Gamini Senanayake and Mr. Rohana Hettiarachchi gave their thoughts on the March 12th Movement and the importance of the message of clean politics. Prof. Senanayake noted that this message needs to be spread throughout the country and heard by all individuals. He also spoke about how the country’s political system is a reflection of society itself and stated that society will need to change before we can expect to see changes in the country’s political system. Mr. Dullas Alahapperuma spoke about the need to regulate campaign finance expenditure to ensure that all candidates are on a level-playing field and to maintain a political culture that is transparent, accountable and free of corruption. He noted that a draft document has been drawn up on the regulation of campaign finances. Mr. Alahapperuma also drew attention to the decline in the registration of new voters, and stated that the public’s distrust of the current electoral system and the country’s politicians is discouraging them from engaging in their civic duties. Women’s representation in politics was another key issue that was discussed, in light of the quota that requires political parties to nominate at least 25% of female candidates for the upcoming local government elections. The Coordinating Officer of the Legal Aid Commission, Attorney-at-Law Ms. Rajika Prasadini Wijethunga stressed that this quota must be used to nominate female candidates who will represent the larger female population and who can contribute intelligently and honestly to local government policy formulation and implementation. The meeting was successful in generating a much-needed dialogue between the public and the key personnel within the country’s political system, and in highlighting salient issues which need to be addressed within the country’s political and electoral systems. The M12 Movement’s citizen’s march officially concluded on the 7th of April with a closing ceremony at the BMICH, under the patronage of President Maithripala Sirisena and Prime Minister Ranil Wickremesinghe.